The sewn-on unique and cool designed 5/8" pre-printed pattern wrist lanyards are designed for custom order or custom imprinted logo. The hardware attachment are firmly sewn-on the wrist straps. The comfort to wear 5/8" pre-printed pattern straps come with a variety of different and fun themes. They can be sewn to any length to fit your specific application. An optional adjustable slider can be added to your order too! Either the non custom imprinted or custom imprinted models are available. Any custom size, length, material, hardware attachment, custom logo and custom imprint are welcome! More patterns are coming please call for detail! 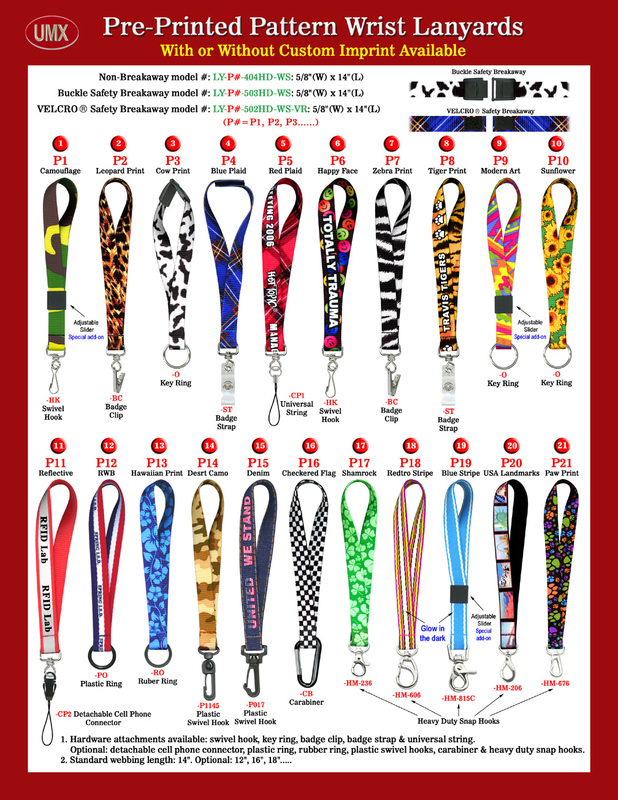 You are viewing Lanyards > Wrist > Custom Order Sewn-On 5/8" Pre-Printed Wrist Lanyards.